The SIUI Apogee 1200v ultrasound for Bovine and Equine veterinary studies is an advanced shared services system complete with color Doppler, a range of imaging technologies, and a compact, portable design. Compared to other Apogee 1200 portable ultrasound imaging systems, the Apogee 1200v bovine equine ultrasound offers superior image quality via features such as Speckle Reduction Imaging, Compound Imaging, and Tissue Harmonic Imaging. With the addition of a wide variety of powerful transducers, this veterinary ultrasound can take on a wide variety of examinations for all of your bovine and equine imaging needs. When viewing or manipulating images, you can enjoy ergonomics, comfort, and ease-of-use with the Apogee 1200v ultrasound’s 15-inch LCD imaging screen. 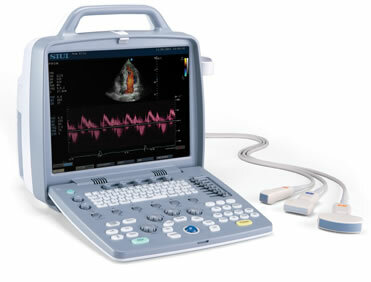 The SIUI Apogee 1200v is a versatile, lightweight portable bovine and equine ultrasound machine for veterinarians. We’ve tested the Apogee 1200 ultrasounds in our office and we were truly impressed with its high-resolution image quality. For Bovine and Equine veterinarians with the necessity and budget to buy a shared service, color Doppler portable veterinary ultrasound machine, this is among the best systems available. The price of the SIUI Apogee 1200v is also very attractive as it’s a new system with 2-year warranty.